Hasselblad's H4D-200MS is yet another upgrade to its H4D camera line that we want badly, but wouldn't have a need -- or a budget -- for. This latest piece of kit is nearly identical to the 50 megapixel H4D-50MS externally, but internally adds an astonishing 150 more megapixels to the mix -- yes, that's an astounding 200 megapixels! Don't feel forgotten just yet if you have the older model, though, as Hasselblad can upgrade your sensor for €7,000 (roughly $10,000) -- a great deal considering the full kit costs €32,000 (about $45,000). With that said, we should note that details are null on the medium-format sensor's native resolution -- similar to the multi-shot feature on the 50MS, the new 200MS combines six shots to create ridiculously detailed 200 megapixel still images, and it handles less intensive photos with a four-shot 50 megapixel still mode. Should you dare to venture outside the studio, there's a 50 megapixel single-shot live mode for quick shots as well. Excuse us while we wrap our heads around the sheer number of pixels; you'll find more info after the break in the meantime. 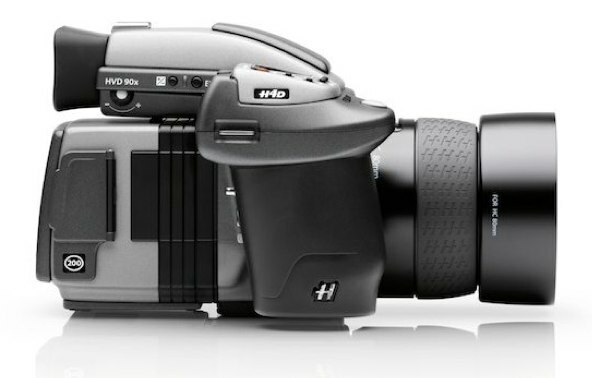 25/05/2011 Hasselblad's latest multi-shot camera, which delivers unprecedented 200 megapixel files, is currently shipping. Upgrades for H4D-50MS cameras are also available. After careful testing for stability and color accuracy, the H4D-200MS - first announced at Photokina last September - is now available. Based on the H4D-50MS platform, the new camera is capable of creating 200 megapixel files for the ultimate in resolution. Since 2000, Hasselblad has continuously developed its multi-shot technology. In 2008, the company announced the first integrated multi-shot camera - the H3DII-39MS - which was followed more recently by the H4D-50MS. As a further development of the H4D-50MS technology, the H4D-200MS utilizes Hasselblad's patented piezo frame module, which now captures 6 shots and combines them into an astounding 200 megapixel file. Designed for studio photographers whose work requires the ultimate in resolution, extremely fine details and exact color information, the H4D-200MS is ideal for capturing images of stationary items such as cars, jewelry, artwork and other high end products where there is no room for compromise in image quality. In addition to its extended multi-shot capabilities, the H4D-200MS offers standard multi-shot and single-shot modes as well. Naturally, this extraordinary capture device offers all the benefits of the H4D family of cameras such as True Focus, Ultra Focus and Digital Lens Correction, to name just a few. The H4D-200MS is available now for 32.000 Euro (plus tax). H4D-50MS owners have the option of upgrading their systems for 7.000 Euro (plus tax) by sending the camera to the factory in Copenhagen, Denmark. While the camera is being converted, the service team will make sure that the firmware and hardware is updated to ensure that the piezo modules' strict tolerances, which are necessary for precise multi-shot capture, are met.